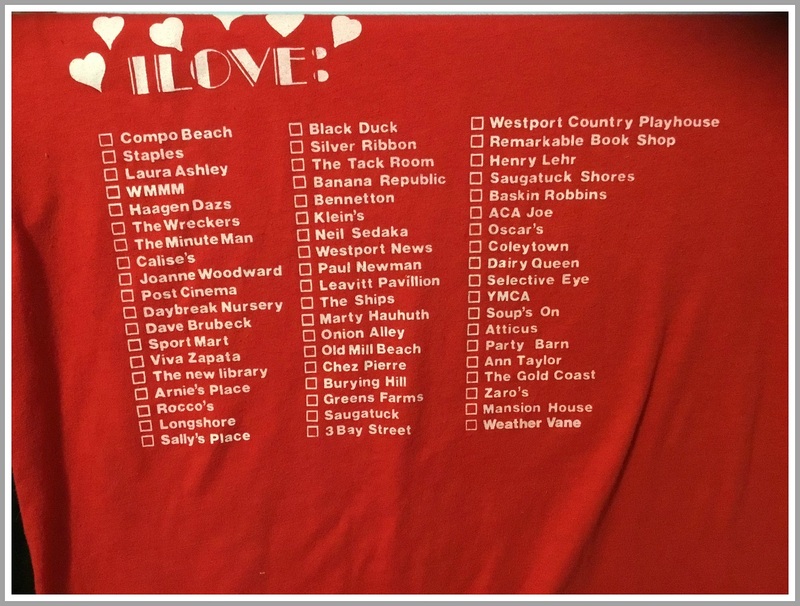 Alert “06880” reader Carol Gluckman sent along this 1980s-era t-shirt. The owner may have loved all those stores, restaurants and more. But unless you’re a beach, high school, institution or neighborhood — or were very lucky — today you’re just a memory. Click “Comments” below to share your memories of any of these golden oldies. This entry was posted in Downtown, Friday Flashback, Local business, People, Restaurants and tagged Carol Gluckman. Bookmark the permalink. It’s not in alphabetical order so I had some trouble scanning it — but where is Arnie’s Place? Nevermind. First column. 4th from the bottom. Calises, Black Duck, Viva’s and the Playhouse still operating! I remember the “disco” ball in the Selective Eye, hanging in the stairs to the second floor! And white plush carpeting up there! Thank you Carol! Those were the days! I would miss Country Gal from the 60s. The Levitt Pavilion wasn’t around when I was in Westport but I did play golf with Mimi Levitt in the above mentioned 60s. Otherwise I loved Kleins, The Sport Mart and of course The Remarkable Book Shop. I loved Laura Ashley and Remarkable. This tee looks extremely familiar! Was it something the downtown merchants put together? Or, perhaps the school system? I’m wracking my brain, trying to recall, because I may have actually owned one of these back then … or seen someone with it on. Oh well, soooo cool to see this! Nice “archive” of the 80’s! Ah, Pearls restaurant … serving up the trendy (at the time … late 70’s, maybe early 80’s) fondue menu! I actually had one of their T-Shirts, and now wish I had saved it for … prosperity. My father bought it for me, right after an amazing family meal there, when I was a pre-teen. Glad I got to live there while all these places were still around! I don’t even recognize downtown anymore! Where are the movie theaters, Le Chambord, Peppermill, Cafe de la Plage, Allen’s Clam House, and whatever the Chinese restaurant at (now) Sconset Square? Or am I on the wrong decade for some of those? I remember all of them. I was a kid when they built the new library and I remember my parents discussing it. I think there was some controversy about building it on the former town dump site(I remember going to the dump with my dad, too). So many nice shops used to be on Main Street…. Yes re the library. There were concerns about methane buildup! Whatever happened to the very first Ann Taylor?